Do you ever find yourself reminiscing about the awesome toys you used to play with as a child? If so, we’ve got the perfect museum for you! The World’s Largest Toy Museum features over 26,00 square feet of toys, antiques, and memorabilia. In fact, there are over 1 million toys inside. You’ll find items from the 1800’s all the way up to today. There are six different museums inside two main buildings. These include: World’s Largest Toy Museum, National BB Gun Museum, Harold Bell Wright Museum, World of Checkers Museum, Stearnsy Bear Museum and the Paul Harvey Jr. Museum. You will be able to go through all of them with the purchase of one ticket! You will see collectible items such as Barbie Dolls, Hot Wheels, Disney items, and much more! There are so many exciting things to look at that you will want to make sure you have time to see everything! The museum takes approximately two hours to go through. However, when you purchase a pass, you are welcome to spend the entire day looking at all of the incredible treasures inside! Guests are encouraged to take photos throughout the museum to remember their time! Also, make sure to stop by the gift shop! You never know what toy you will find that you will want to take home! 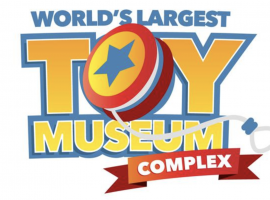 Guests will be sure to enjoy their time at the World’s Largest Toy Museum!